Doug Pagitt is a pastor, author, speaker, Ultra-Marathoner, goodness conspirator & possibility evangelist. The audio feed from Doug Pagitt's LiveStream conversations with interesting people about the beautiful ways they live their lives. Most episodes are filmed with Doug and guest in leather chairs at the famed Peacedale Studio where Doug's other Podcasts are created. And, most episodes include Doug and guest enjoying a bottle ... See More of wine as they talk. 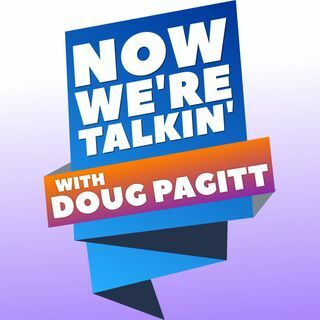 Now We're Talkin' with Doug Pagitt is Doug's Interview podcast. Doug talks with news makers, leaders, culture creators and people who are making a more beautiful world. Both Doug and Adam are committed to their Christian faith and Doug finds it incomprehensible that Adam did and does support Trump. Their interaction is about growing in ... See More understanding and comprehension.